The windows are already foggy as I wait in anticipation for your arrival. The day’s activities washed away by the shower streaming from the head that is just a bit too low on the wall. “I’m outside” came the message on my screen as I began to write those words. There was going to be some musings regarding how my moments leading up to her arrival were spent. The day and hours filled with thought and expression. There were a few moments when I decided to challenge my muscles with a short work out. There have been way too many days since they have had to do anything strenuous. Aside from the obvious. All those grooming techniques that one develops throughout life become ritual. My new subscription to one of them music streaming services has provided me with a discover playlist. There have been some good tunes and all have been unfamiliar to me so far. There has been one artist that has captured my ear as I explored the best albums of 2015. 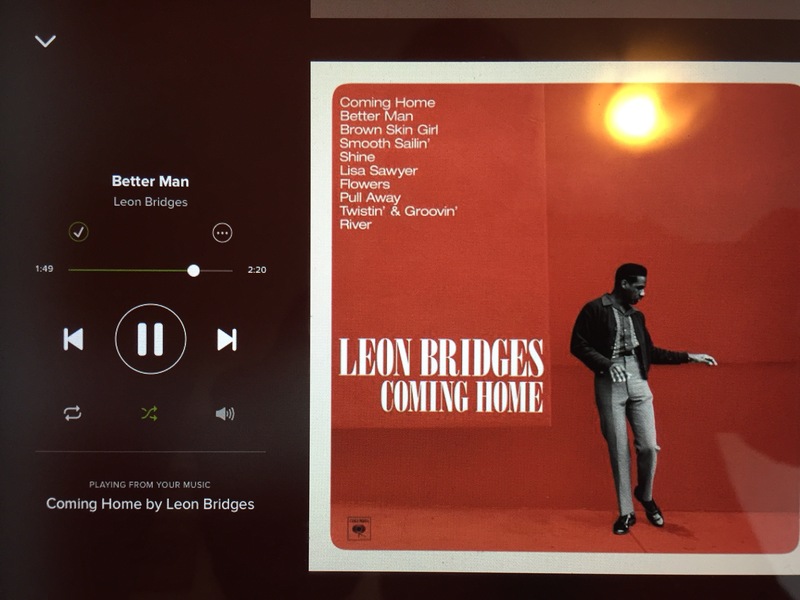 Leon Bridges put out an album that sounds like it has come straight from the middle of the last century. Smooth vocals singing soulful lyrics that lift the heart and take you away on a dream like journey to the deep American South. You can almost feel the sweat pour down your body as you sit in a humid tropical environment listening to this music out on the bayou. In this instance it invokes the feelings of romance as I carefully remove the stubble from my face. I listen to the playlist again to make sure I can get the most out of the suggestions. I had recently read a story about how the algorithm that builds these suggestions operates. The amount of data sifted is quite extraordinary. As expected the music in this playlist has reflected my most often played songs. These are the soulful sounds mentioned above. It is not all smooth balads however. There is some pulse to the selection. All those thoughts were gone as we said our “hello” exhausted from our effort listening to the sounds eminating from the speakers. We discussed dinner plans as we cuddled laughing at the steam that had fogged the windows up. I had kept the bathroom door open in order to listen to the music and the phone. We walked arm in arm down the road in the relative darkness of the chilly night. Once the sun set the temperature dropped. The air around the city has been remarkably clear despite the grey that is pushed towards the coast by the barrage of weather systems heading our way. I showed Barbs the satellite animation. Ive been watching the cloud cover lately to see if there would be a remarkable sunset in the making. 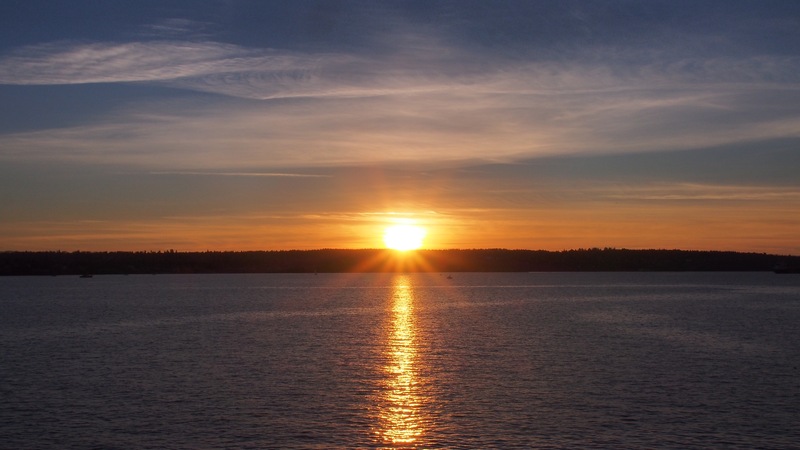 I’ve found that some cloud is needed to turn the setting or rising sun into time lapse gold. We walked along Denman and read the offers given by the restaurants. We were going to have something western tonight and the question was which place is it going to be? We decided on a small restaurant that had recently been renovated. We had one of the set course meals that they suggested. The place wasn’t packed and we had a lovely time talking about our relationship and all that we have gained. It would be a theme we returned to again and again during our time together. We had a lovely time and decided to watch a movie… We picked the Dallas Buyers Club. Maybe not the most uplifting movie out there but it was an interesting one. I can see why there was so much buzz surrounding it. The whole entertainment industry, if I remember correctly, had to decide between this film and a few others for the Oscar. We discussed what we saw and how the epidemic changed the way society functions and how it views those currently infected. There is certainly a lot more information out there regarding what it is and how to a, protect yourself and b, treat it. The movie through the exploration of one man’s determination portrayed those early days when news of this infection gripped the headlines. This doesn’t happen as much anymore unless it’s someone prominent that contracts it. We made plans for breakfast and festidiously got ready early in order to beat the rush that usually always starts at these breakfast places after about nine-thirty. We had a cozy seat in the back away from the door that allowed the cold air to get in. We continued on sharing stories of our youth and how they influenced our lives and continues to do so to this day. We are aware of our existence and the paths that have become our lives now briefly intertwined. I’m slowly organizing piles of stuff that has to be packed. There were boxes that contained memories and momentos. I should probably pack them right so that they will be easily distinguished from all the other stuff that will also be put away. I am going to travel light for now. Let’s see how this works out. Barbs worked on adding the portions of the travel portion that was missing when she gave me the gift. The final word count is in the neighbourhood of a hundred grand! It appears that I have written my first book! I can’t wait until it’s finally published. We said our goodbyes just before the sun was about to start setting. She had some meetiing to go to and I was about to find a place and watch it set capturing it as best as I can. I was going to make a time lapse but as I proceeded to capture it I noticed that some setting wasn’t quite right and the colors and clouds weren’t as nice as I would have wanted them to be. It felt quite cold to me and after some time I gave up and proceeded to go back to the flat and maybe do something before retiring. I got distracted reading the Sean Penn article detailing his meeting with the head of a cartel. I haven’t read all the reactions to it but it seems like in the press he is being blamed for the arrest a few days ago. I’ll start my last week of work tomorrow before venturing out into the world again away from the cocoon of this west coast life.